Angama Mara is a stunning safari camp in one of the most ideal locations in all of Africa, literally hanging from the rim of the Masaai Mara hilltop where “Out of Africa” was filmed, and where the annual migrations are at their most breathtaking. 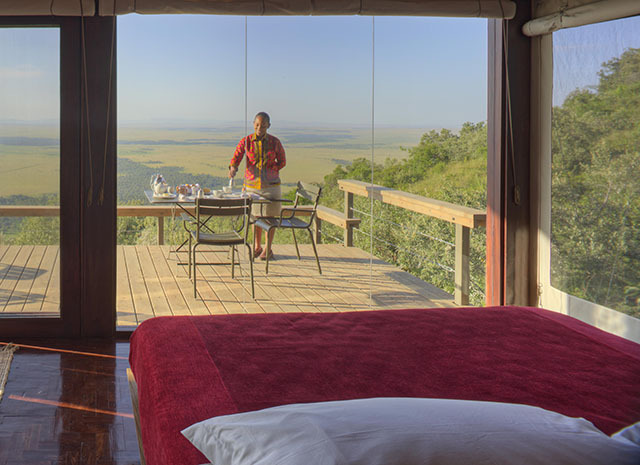 An awe-inspiring panorama spreads below the floor-to-ceiling panoramic windows of each elegantly minimalist tented suite. Yes, there’s a pool and exercise room and gorgeous dining areas – this lodge succeeds in expelling the frou-frou and revert to the opulent simplicity of the safaris of the 1920’s. Angama Mara is a combination of the finest hospitality, clean design, splendidly friendly cuisine, and the finest interpretative safari guiding in the entire continent.